A human brain weighs only 3 pounds — 2% or less of the total body weight of most adults. Yet the brain consumes 25% of your oxygen and 20% of your energy. No wonder humans spend so much time making decisions the easy way — by reflex or habit — rather than the hard way, by setting and achieving goals. That’s because our brains naturally try to conserve energy. Now we know why, in terms of brain science, content marketing is so hard to do. When we cook up new content, we’re up against naturally lazy, stubborn brains. Thanks to new insights from cognitive neuroscience, now we can better understand what’s going on in buyers’ brains. With that understanding, content marketers can take specific steps to improve the odds of marketing success. 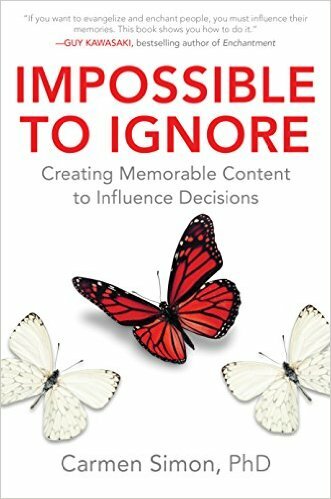 Cognitive neuroscientist Dr. Carmen Simon unlocks secrets of the brain for marketers in her new book, Impossible to Ignore – Creating Memorable Content to Influence Decisions. Great content marketing helps buyers identify their own intentions or clarify new intentions at Point A. Able to easily roll off the tongue. Simon notes that the most memorable movie lines like “Round up the usual suspects” from Casablanca and the most effective advertising taglines like “Just do it” from Nike have common characteristics. They are timeless messages that can apply in multiple contexts and are aspirational. They use simple syntax, include unusual words, and evoke memories consistent with a desired self. It’s hard enough to win buyers’ attention with content at Point A. However, it’s much harder to get buyers to remember your content when they make a decision at Point B. Most of the memories people forget do not involve the past, but the future. The majority of memory problems, 60% to 80%, involve prospective memory — when we forget to act on intentions we formed in the past. When buyers don’t follow through on their intentions at Point B, they don’t buy your product. Instead, they buy a competitor’s product or they don’t buy at all. “Think of organizations that want to motivate us to bring our own reusable bags into the grocery store. The message says, ‘Save the environment. Bring your bag into the store,’ and you believe the message but find yourself in the store thinking, ‘I just forgot the darn thing,’ and end up paying for new bags? “What is the reason we’re failing on this example of prospective memory? The message is not strong enough to stay in our memory at Point B. “A better approach would be that, as you get out of the car, you see a giant message in the parking lot that says, ‘Save the environment. Bring your bag into the store.’ Back at point A, they advertise with exactly that same message that we’re likely to see at point B.
Neuroscience illuminates a clear path to marketing success. We succeed when we help customers remember the content they experienced at Point A when they reach Point B and make a decision. To succeed, deliver content today at Point A that buyers will see again at Point B — when decision time comes. That makes buyers much likelier to buy. “Signed contracts are a very good example of a future intention. Create things at Point A in order to be influential enough at Point B. Then ask, what will happen in your customer’s world at Point B to help them make that decision. “At Point B, customers may notice some cues, which is where attention comes into play. Maybe you send a reminder message, or a PDF with benefits the customer will gain by signing the contract. Maybe you and he are friends on LinkedIn and you publish an article, and your name stays on his mind. He’s noticing your name again. “If these cues are strong enough, distinct enough, and linked enough to your brand, to your message, to what you’re proposing, then that triggers some memories. Recognizing that your audiences (like all of us) have “lazy brains” is an important revelation to understand as you create and implement your content marketing strategy. You have to appreciate the trip from prospect to buyer, going from Point A to Point B is not a direct line. And to ensure that you are part of the prospects’ trip through Point B, you must focus on their future intentions. 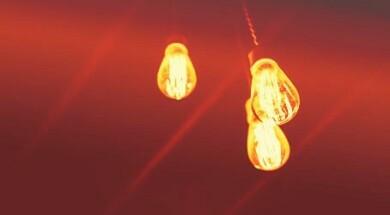 Want to exercise your brain every day to strengthen your content marketing skills? Subscribe to the free daily or weekly CMI newsletter.